NEW YORK (CNNfn) - Amid the summer doldrums the stock market is facing, riskier investments known as hedge funds that attract wealthy individuals and pensions are outpacing most major benchmarks. Although hedge funds ran slightly ahead of the market in July, they teetered around negative territory. Several hedge fund indexes were down for the month including Hedgefund.net, down 0.77 percent, and Van Hedge Fund Advisors Index, which tracks about 450 hedge funds, down 0.4 percent. 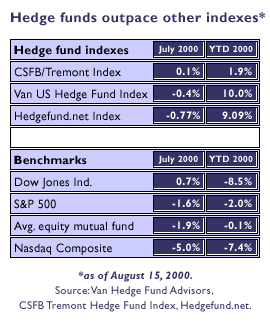 The CSFB/Tremont Hedge Fund Index was up just 0.1 percent in July. So during the seasonal market slump, hedge fund performance also exceeded mutual funds. Since the beginning of the year, hedge funds have posted a 10.0 percent average return, according to the Van U.S. Hedge Fund Index while the average equity mutual fund is down 0.1 percent as of Aug. 15, according to fund tracker Morningstar. "I would say it has been so far a good year," said Meredith Jones, vice president and director of research at Van Hedge in Nashville, Tenn. "You're looking at the (major market) indices which were all down over July, so I think this is why people invest in hedge funds. This is what makes (hedge funds) attractive." So while the markets have been choppy, hedge funds have stayed above water. Unlike mutual funds, hedge funds, which are unregulated pools of money, use riskier strategies such as leverage and shorting to take advantage of falling markets. Barry Colvin, chief operating officer with Tremont Advisers, in Rye, N.Y., says hedge funds actually thrive on volatility in the market. "That's a lot of what hedge funds are based upon, taking advantage of the inefficiencies created by volatility," he said. "The first half of the year has been really pinpointed by the volatility and what that has meant to certain sectors." In July, many of the major market indices wilted. For example, the Nasdaq, which took a nosedive in April was still recovering in July, down 5 percent. But as of Monday's close, the tech-heavy index reached above the 4,069.31 level where it began 2000. It's been a wild ride between then and now. The Nasdaq soared above 5,000 in March only to fall below 3,200 in May. It has ground higher ever since. Also in July, the S&P 500 was down 1.6 percent. The Dow Jones industrial average was up 0.7 percent. Unlike index mutual funds, hedge funds seek to outperform the market, said Bob Sloan, managing director at Credit Suisse First Boston. "Hedge funds are synonymous with actively managed money," Sloan said. "Is it unusual to outperform the major indices? I think it depends on what segment of the market you're looking at." Hedge funds tend to attract wealthy investors seeking to round out their portfolios. Minimum investment requirements can run as high as $1 million but some mutual fund companies are starting to offer hedge fund type investments with lower minimums to attract the average retail investor in and to keep their top fund manager talent who may be enticed to start their own hedge fund. The Invesco Funds Group, for example, introduced the Invesco Advantage Fund at an initial-offering price of $10 per share with a $10,000 minimum investment - much more in line for retail investors. If hedge funds continue to outperform mutual funds like they have through the summer doldrums, investors getting back from vacation could take notice. "Hedge fund performance is chugging along this year," said Jim Gillies, vice president and chief information officer at Tuna Group, which runs Hedgefund.net. --Staff Writer Jennifer Karchmer covers hedge funds for CNNfn.com. Click here to send her email.